McKinsey & Company; ExxonMobil (SeaRiver Maritime); American Bureau of Shipping; Herbert Software Solutions, Inc.
How does a person go from naval engineering to producing high-end greeting cards? For Wombi Rose, MBA 2015, the journey took an important turn in Ho Chi Minh City, Vietnam. "There is no better way to get to know your classmates than to be thrown into a foreign city, with a whole bunch of teams doing different things for different partners," says Wombi of his FIELD 2 experience. Wombi's assignment was challenging: A local television station wanted to expand its existing online dating service into a mobile application. Between the language and cultural barriers, Wombi notes, "pretty much everything was completely different from anything we'd worked on before." Then, during a stretch of downtime, Wombi and his college roommate, John (who happened to be on the same trip), "were walking one evening through the streets of Ho Chi Minh City and happened to run into these incredible, incredible artistic pop-up cards—and we both fell in love immediately." Wombi and John were not only engineers, they were naval architects, and they recognized the possibilities immediately. "We realized we could engineer anything into a pop-up card. So having seen a few of these, it was just, what can we make?" Wombi and John returned home with a number of pop-up cards; their instant popularity convinced them to go into business—with their own products. "You can't build a brand on other people's designs," says Wombi. 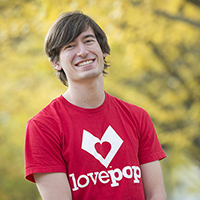 But the resulting business, LovePop, has been built through a variety of resources available on campus. "We've probably used every HBS resource under the sun, and they've been tremendously helpful," Wombi says. In their RC year, he and John made it to the semi-finals in the New Venture Competition, gathering important feedback along the way. As part of the i-lab's VIP program, LovePop got critical inventory space and one-on-one mentoring from Adrian Gill, the former leader of Puma's footwear division who has contributed "marketing concepts that are just out of this world." Perhaps most significantly, LovePop is involved in the Rock Accelerator, "a relatively intense program where you keep going in front of this investment committee," first to get into the program, then to gain financial support for the company's growth. "It's just constant communication about what you're doing and why you're doing it," Wombi says. "It's amazing how every single time you're working through one of those, you go home with a laundry list of ideas to try." "So what drives me?" asks Wombi. "It's absolutely a love for what I'm doing in the given moment. So many people are driven by the end goal, the outcome. That's not me. I get excited about what I'm doing every day, and if I'm not excited about what I'm doing every day, then I don't function. LovePop exists because human relationships are special, and they need to be cultivated and maintained. And we all need to do better at doing things for the special people in our lives."